^ a b Oz., Clarke, (2001). Oz Clarke's encyclopedia of grapes. Rand, Margaret. (1st U.S. ed ed.). New York: Harcourt. ISBN 0151007144. OCLC 48239622. https://www.worldcat.org/oclc/48239622. ^ Carménère grape variety Archived August 31, 2007, at the Wayback Machine. by Sue Dyson and Roger McShane. FoodTourist.com, Retrieved February 19, 2008. ^ Servicio Agrícola y Ganadero (Chile), Catastro viticola nacional 2009. [リンク切れ] Retrieved September 8, 2010. ^ 1939-, Johnson, Hugh, (2001). The world atlas of wine. Robinson, Jancis. (5th ed ed.). London: Mitchell Beazley. ISBN 1840003324. OCLC 59530596. https://www.worldcat.org/oclc/59530596. ^ C. Fallis (2002). The Encyclopedic Atlas of Wine: A Comprehensive Guide to the World's Greatest Wines and Wineries. Macquarie Park, N.S.W. : Global Book Publishing. ISBN 978-1-74048-050-5. https://www.worldcat.org/oclc/223271299. ^ a b ChileanWine.com.com, au., The Lost Grape of Bordeaux: The Carménère Grape Story. Archived February 20, 2008, at the Wayback Machine.. Retrieved February 19, 2008. ^ Jancis., Robinson, (1987). Vines, grapes and wines. (Rev. reprint ed.). Mitchell Beazley. ISBN 1857329996. OCLC 27687025. https://www.worldcat.org/oclc/27687025. ^ a b WineReviewOnline.com, Greatness Attained: Carménère Archived November 10, 2006, at the Wayback Machine. by Michael Franz. October 31, 2006. ^ a b c d e Block, S. When I first heard about Carménère, I was certain it was a hoax. Archived April 9, 2008, at the Wayback Machine. ^ OopsWines.com, Mystery of The Lost Grape of Bordeaux solved; (oops)™ now on wine shelves across America. Archived April 9, 2008, at the Wayback Machine. Schwartz Olcott Imports, December 15, 2006. ^ See Alley, L. The French connection: Jean-Michel Boursiquot., Highbeam.com. November 1, 2001. ^ Caputo, T. Is Carménère Chile's best hope? Chile's winemakers weigh in. Wines & Vines. January 1, 2004. ^ Terlato Wines International, Ca' del Bosco. Archived September 29, 2007, at the Wayback Machine.. Retrieved February 19, 2008. ^ CENTRO TECNICO NAZIONALE F.I.S.A.R. Elenco dei vini DOC e DOCG d’Italia, Centro tecnico nazionale F.I.S.A.R., September 30, 2007. ^ ‘Malanotte e Carmenère: due nuove tipologie per la DOC Piave’, Marcadoc.it : Turismo, Cultura e Informazione nella Provincia di Treviso. ^ Sally's Place, Make Way for the 6th Bordeaux Variety by Sara and Monty Preiser. Retrieved February 19, 2008. ^ a b c Oz., Clarke, (2001). Oz Clarke's encyclopedia of grapes. Rand, Margaret. (1st U.S. ed ed.). New York: Harcourt. ISBN 0151007144. OCLC 48239622. https://www.worldcat.org/oclc/48239622. 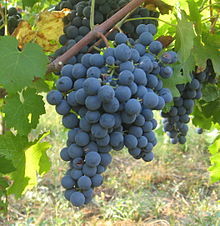 ^ PCCNaturalMarkets.com, Resources, Healthnotes: Red wines - Carmenere. Retrieved December 16, 2007.